This article lists known issues in the RadMultiColumnComboBox control. RadMultiColumnComboBox does not support design-time at the moment. When you open the Design-time surface of Visual Studio, RadMultiColumnComboBox instances will not render and will throw the Failed to create designer error. RadMultiColumnComboBox supports only the Default skin. 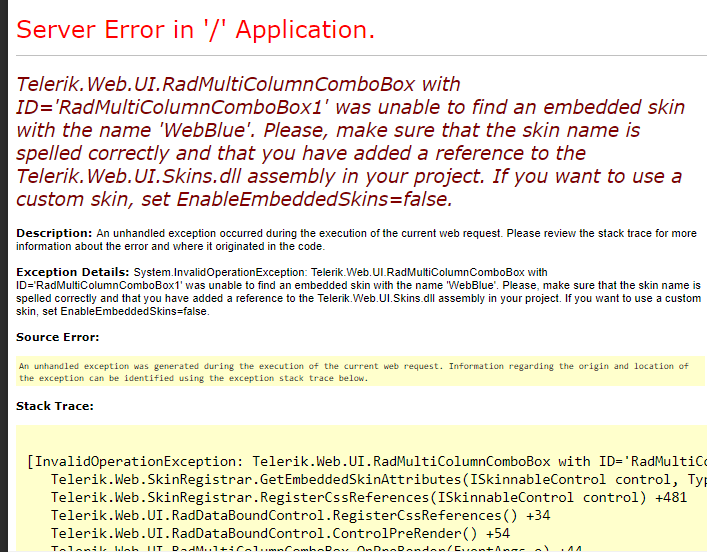 Setting a different skin name will result in a runtime error like Telerik.Web.UI.RadMultiColumnComboBox with ID='RadMultiColumnComboBox1' was unable to find an embedded skin with the name 'WebBlue'. Please, make sure that the skin name is spelled correctly and that you have added a reference to the Telerik.Web.UI.Skins.dll assembly in your project. If you want to use a custom skin, set EnableEmbeddedSkins=false..